I am back with another 5 ingredient recipe! 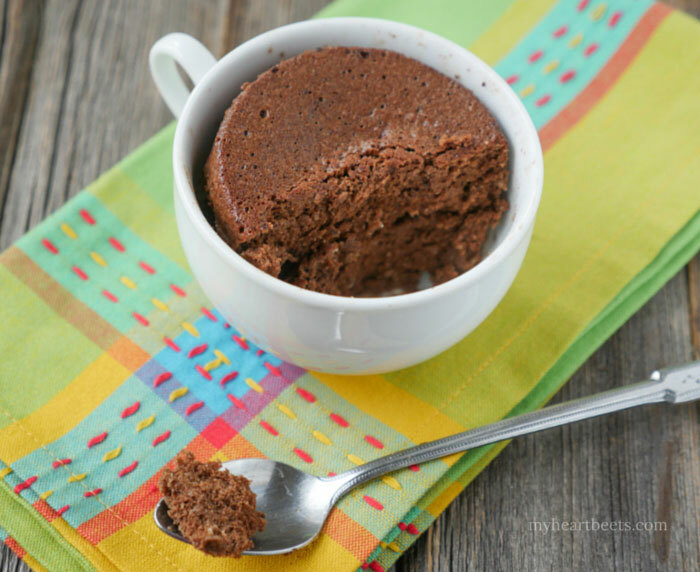 This chocolate mug cake is ready in minutes. It’s perfect for when a sweet craving strikes… instead of reaching for packaged junk, make yourself a nice cup of cake. If you want to make this perfectly dense and moist cake even more decadent, add some allergy friendly chocolate chips! You can also add your favorite spice – vanilla, cinnamon, cardamom – for variety. I find this cake to be sweet – but not overly sweet. 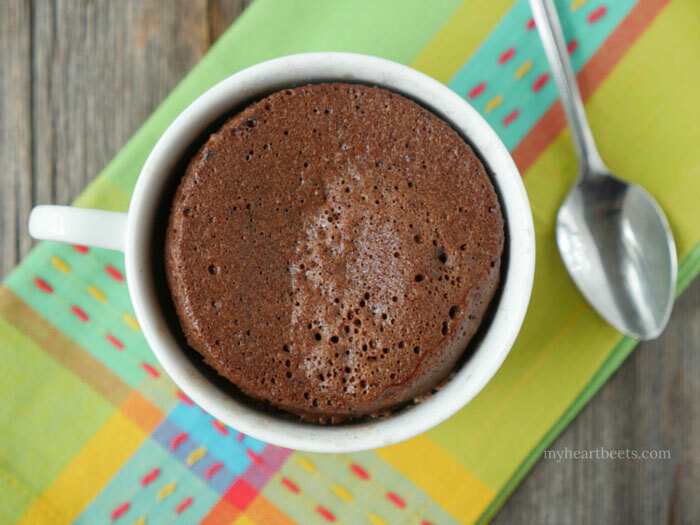 It’s not quite as good as my chocolate cake recipe (perfect for a special occasion) but given that this mug cakes takes less than 2 minutes to make… in terms of convenience and instant gratification, it really can’t be beat. This is the perfect dessert for one… or two. It’s very filling and so if you can, try to eat just half in one sitting. I feel like I have to say that, but the truth is… I always eat the whole thing. Do as I say not as I do? The good thing about this mug cake is that once I’m done eating it… there aren’t several other lonely slices of cake sitting on the counter calling my name. One more thing – you should know that this is a microwave cake. You mix together a few ingredients in a mug, and then you nuke it for 1-3 minutes. All microwaves are different – mine takes about a minute and a half to fully cook this cake. If you’re anti-microwave you can pour the batter into a mini cupcake maker (I’m the queen of kitchen gadgets, so I have one… obviously) or you can bake it in the oven, but that’ll take longer. If you’re going to bake, you might as well make my chocolate cupcakes instead. Optional additions: chocolate chips, vanilla, cardamom, cinnamon, etc. Add the egg to a microwave safe mug and whisk. Next, add the remaining ingredients and mix until well combined. Microwave for 1-2 minutes, or until the cake is done. Girl you are amazing!!! I just made this as well to go with my Thai curry meatballs this is soo good! Thanks for all the wonderful recipes! Thanks, Mimi!! So glad you liked the meatballs and the mug cake!! YUMMY – made it last night and it was wonderful!! Is there anything I can use to sub the Ghee?? My husband was not a fan and kept asking….”what is that”? Umm – I don’t know – lol! I tried to sneak 100% paleo on him and he caught me…I will continue to do it with mine but wondering if I can just use organic butter on his. Leslie, so glad you liked it! Yes, you can definitely use butter for his cake – or you can use coconut oil (but I’m guessing he may not like that either?). This looks great but have you made it with anything other than almond flour? My husband is allergic to almonds and cashews. Thanks! Hi Sarah, no but I do want to experiment with coconut flour! When I come up with something, I’ll post it! 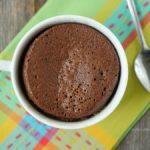 I LOVE mug cakes and I love all of your recipes! Unfortunately, on of my little guys has serious tree but allergies..could I use coconut flour instead? I know it’s different in texture and much drier..what would you do? Oh man, I’ll add coconut flour mug cake onto my list of things to make! If you want to try adapting this recipe… maybe you can omit the almond flour and use 1 tablespoon of coconut flour instead. If it looks dry, try adding 1 tablespoon of coconut milk. This is honestly just a guess so I can’t make any promises but if this works, please let me know! I just made this cake and it was delicious!! I made it exactly as the recipe says, except I used a tsp of canola oil instead of ghee (I am not paleo). I topped it with chocolate hazelnut spread and it was so tasty and filling. This is the best mug cake. It was so easy to make plus simple and real ingredients. Thank you for this recipe! Katie, so happy to hear that you liked the recipe 🙂 Thanks for sharing! I went Paleo in August 2014 but I am brand new to your site. I tried the mug cake as my first recipe of yours. It was so quick, easy and it killed that craving I was having for dessert. I only used 1 tblspn of maple syrup and it was fine. I really don’t like anything sweet since I’ve virtually eliminated all sugar from my diet. Can you come up with a few more like this? Not a huge fan of chocolate. Thank you! Glad you liked it, Cindy!! I made this today for my non-Paleo husband on his birthday with a candle stuck in the middle. I added some vanilla and Enjoy Life chocolate chips. He loved it! This cake is THE BOMB!!! Just made it and enjoying it now. Just tried this after finding it on Pinterest. This recipe rocks!! Yay! Glad you found my blog, Lauren! And happy you liked the recipe! Yummo!! Had it with Greek yoghurt and raspberries. I made this tonight and it was yummy. I enjoy your videos also. Thanks for making paleo easier! Thank you, Patti!! 🙂 I appreciate the kind words! This cake hits the spot when I just want a serving of sweet. I changed it to fit my sweetness preferences by using 1T maple syrup, 1T coconut milk/gf cream and few tsp of Enjoy life chocolate chips. The chips make up for the maple syrup. I get my own little brownie in a few minutes. My non-paleo 13 yr. old loves it too. I just made and ate this for BREAKFAST! Not my finest hour but I knew as soon as I saw this I had to try it. It was so worth it! Delicious! I went to make this tonight and forgot that all the almond flour was gone. I used the Hodges (sp?) gluten free baking mix. I also had used up all my ghee making bulletproof coffee during the Christmas rush so I used Coconut oil. It turned out a little dry but I just poured some cream (not paleo) over it and it was yummy. I think it would have been just as good with some warmed up jam over it. Thanks for a great new dessert! I was out of almond flour and used hazelnut meal/flour. It was fantastic. I also added a few chopped dried cherries and some pecans. Love chocolate and cherry together. Thank you for a recipe I will definitely add to my favorites! Annette, so happy to hear that!! I must try this with hazelnut flour and cherries! yum! I just made this mug cake but used your suggestion of 1T coconut flour and 1T of cream (I didn’t have coconut milk) and i used grass fed organic butter instead of ghee, it turned it out great! 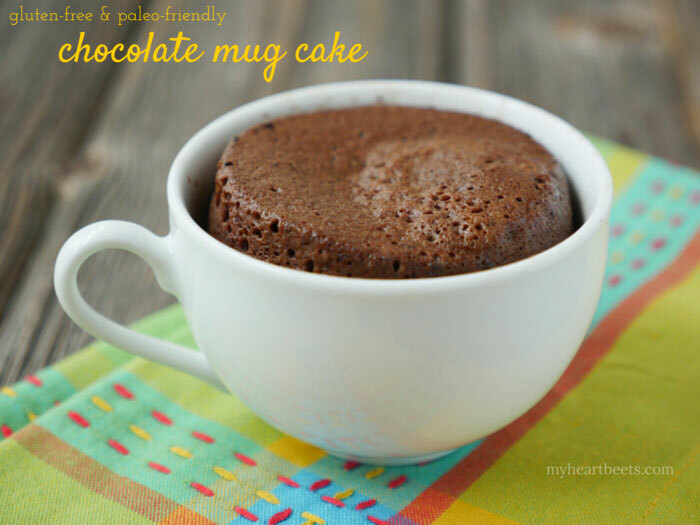 My go-to Paleo mug cake recipe!! So, so, so good! I use the exact ingredients and microwave for just one minute. Incredibly moist and delicious, and very rich from the cocoa powder. Couldn’t recommend this recipe more! I made this recipe last night as written but used coconut oil. It was very good. I tried it tonight with 1 T coconut flour and I added 1/2 t vanilla, a sprinkle of cinnamon and 3 t water because it was quite thick. Instead of mixing it in the mug I whizzed it in the food processor for a finer consistency. It is awesome this way! Mine turned out SUPER DRY. What can I do to mak it moist? I’m not sure, maybe try adding a little more ghee next time? This is such an awesome recipe!! So perfect to fulfill my chocolate craving without making a whole cake. I will definitely be making this again and checking out your other recipes!! Thanks, Ally! 🙂 Can’t wait to hear what ya think of my other recipes! Yum! I am not much of a chocolate person but when I want it I want it, and this did not disappoint! I am one of the anti-microwave folks but I caved in to try this. Delish! Next time I will pop in the oven to see how it turns out. My question is could this be made without using a microwave? I haven’t used one for 7 years now but i want to see about making this cake. Thanks! Melissa, I’d suggest making my paleo chocolate cake or cupcakes if you want to use an oven. Let me know how they turn out for you! We have nut allergies so tried this with 1 tbs fine coconut flour sweetened with coconut sugar and honey. Didn’t have ghee so used pasture raised butter. Made a chocolate version and a vanilla version – kids gobbled them up! The chocolate version came out more cake like – the vanilla was a little “custardy”. Thanks so much for posting nut free paleo recipes – both Asian and Western foods! Finally tried this tonight, and it was delicious! Except for using grass-fed butter instead of ghee, I followed the recipe exactly, microwaving for 1 minute. I think I will add a splash of vanilla extract next time and maybe some cinnamon, and I’m seriously considering making this a breakfast dish with some cold almond milk poured over the warm cake 🙂 Thank you! Awesome! I’m so glad you liked the recipe 🙂 Cold almond milk over warm cake sounds like the perfect breakfast! Yum! That sounds awesome, Nisha! I put this recipe into myfitnesspal recipe calculator and a whole recipe comes out to 440 calories, 26g fat, and 46g carbohydrate. I subbed extra virgin olive oil and added 1/2 tsp. vanilla extract. It’s really yummy, but just be aware it’s not a low cal food by any means. I would suggest splitting it into two custard cups and microwaving it for a shorter time. Dust with a bit of powdered sugar and split with a friend or partner! I was so happy when I saw someone shared this on facebook, but then I saw that you use ghee.. I’ve noticed a lot of people use ghee, but it isn’t really paleo, is it? I made this cake, delicious! I used flaxseed instead of almond and oil instead of ghee. Yum! Delicious, quick, and simple with healthy ingredients. Having something instant AND healthy makes me feel less guilty about the fact that it’s microwaved, lol. Thank you! My first mug cake and it came out great ! Thanks Ashley for this great and easy recipe ! This one’s a keeper ! Cant wait to try out your other recipes. Really moist, quick snack that completely satisfied my chocolate craving without all the carbs! Win win!! WOW! The only problem with this recipe is that its TOO good. Now that I can make chocolate cake in under 3 minutes, I’ll have to rely on self control not to eat them every day. I added chocolate chips to mine! Topped it with a touch of peanut butter. Would be great with strawberries and whipped cream too! I’ve had such bad luck trying gluten free desserts on my kids, but I finally found one they like. In fact, they like it so much, this is my third night in a row making them. I used grass fed butter instead of ghee. I’ve also found it to be very versatile. The last 2 nights I subbed the 2tbsp of cocoa for matcha (freehanded amount) & it was amazing. Thank you so much for this recipe!